Safe, Rugged and Easy to Use. Built to articulate and self-level, SafeRack’s SAS gangways are designed to accommodate varying heights of vehicles. And they’re designed to last, too. With a one-piece stair design, welds are reduced and failures are virtually eliminated. Still, despite being extremely rugged, our SAS gangways are easy to use, as the spring counterbalance requires minimal effort. On top of that, the self-adjusting stair gangways can easily be retrofitted to replace your old, unsafe gangways. SafeRack's patent pending G4Series truck and railcar gangways and bridges have been engineered for durability and ease of use. 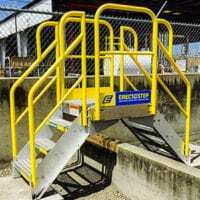 These access gangways are built to stand up to abuse with rugged, oversized parts and feature counterbalanced and adjustable springs which help raise and lower units with minimal effort. SafeLok is a one-of-a-kind safety device that prevents operators from bypassing the gangway safety system. The innovative mechanism keeps gangways securely locked in the down position until an operator returns to the main loading platform where the lock can then be released to raise the gangway. This unique solution prevents the gangway from being moved until workers are safely out of the work area. 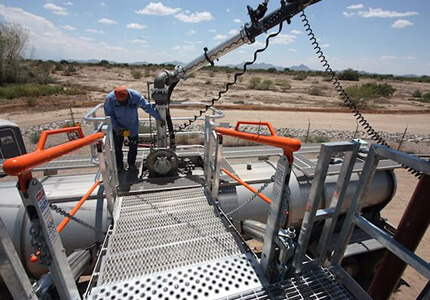 SafeRack walkways serve as a loading ramp for trucks or railcars. The gangway is available in various widths of 24 ½, 36, 48, 60, and 72 ½ inches; and lengths of 3 ½ to 7 ½ feet. SafeRack supplies more OPW and Emco Wheaton loading arm systems than anyone in North America. 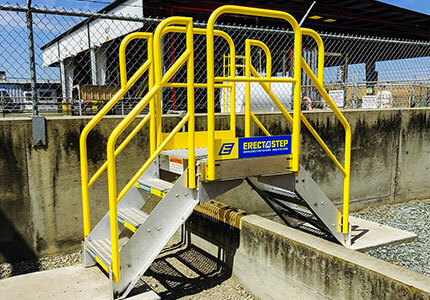 ErectaStep® metal stairs and industrial maintenance work platforms. Customer Service experience was an A+. This gangway was purchased specifically for a new construction vessel. SafeRack was the only vendor who could meet the specifications required. The job required the gangway to be aluminum and handrails to be collapsible. This feature was provided as requested without any problems. Engineering of the product as well as quality were very acceptable. Delivery of the product was also as expected. We would recommend this product for its quality and capability to provide special requirements.